Click to watch the video interview! 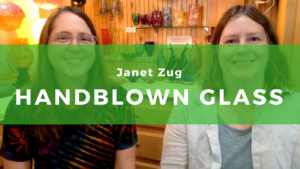 Janet Zug of Zug Glass Studios has been blowing glass for over two decades. In the interview we discuss her start as a contract glassmaker with no experience and how her signature style has developed with her expertise. You can find more of Janet’s work on her website, or follow her on Instagram. Janet’s work is also available regionally in these galleries and stores. To find a glassblower in your area, check out the Glass Arts Society, or check out the Penland School of Crafts which has programs on glassblowing and many other disciplines.